Blessing: Artemis’ blessings are wildness, self-reliance, physical prowess, cunning, skill, and closeness to nature. She protects the innocent, especially the wild creatures of the forest, but also pregnant women, children, and those who are just. She punishes wrong-doers, especially those who offend the Gods through hubris or unremitting pride. 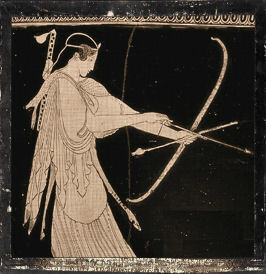 Ways to honor: The best way to honor Artemis is to care for the natural world. Clean up pollution, protect wildlife, donate time and money to ecological concerns. But don’t just do it from your safe cities: actually get out into the wild, and experience the natural world. Go on nature walks, go for picnics, camp, hunt – but get outside! If you eat meat, respect the animal that it came from. Hunt, if you can. Be mindful of what the animal went through, and the intimate connection that exists between its death and your life, even if you can’t. Be respectful of personal space, privacy, and of women-only spaces. Support pregnant women, children’s rights, and women’s sports. See Also: Unbound: A Devotional Anthology for Artemis, released by Bibliotheca Alexandrina, the publishing arm of Neos Alexandria.